Well, it is that time again. Time to post my favorite products of the month! 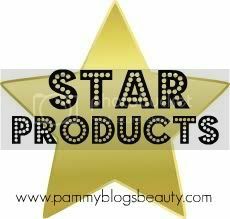 I strive to pick total stand-out products or "Star Products". Typically, these are products that I have found myself reaching for over-and-over again during the past month. So, these are truly items that I am totally loving and currently using all the time! I adore watching my fellow bloggers/vloggers "Monthly Favorites" YouTube videos and Blog Posts. I look forward to doing this blog/YouTube post every month! I have streamlined my process. I keep a running monthly list on my "notes" on my iPhone. Each item has been carefully considered. I occasionally have repeats as well. Often they are items that I have reviewed or am currently in the process of testing. But, sometimes they are just random products that I love. Or even items that I can't believe I haven't mentioned before! 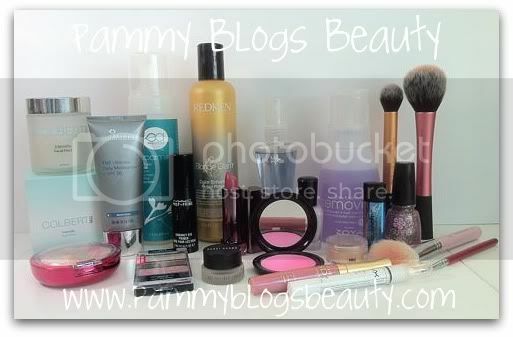 Check out some of my other Star Products posts from this year: January 2011, Feb 2011, March 2011, and April 2011. For my full "Star Product" list, photo, and YouTube "Star Products" video (yes, I am back in video mode!!! ), keep on reading! I know its kinda hard to get a good view of each product in the above picture. But, no worries, be sure to check out my YouTube Video below which features each of these products! MAC Prep + Prime Vibrancy Eye Primer : I adore this product! It works wonders in my under-eye area. You apply this after your eye cream and before concealer. Your concealer will apply very smoothly on top of this. It actually makes all of my concealers work better. A total "Holy Grail" product for me! Check out my full review: MAC Prep & Prime Vibrancy Eye Primer. the Balm timeBalm Concealer(lighter than light): Wow! This stuff is "da Balm" (tee-hee!). I have terrible under eye dark circles and am on a constant quest for good concealers. I need a product to have heavy coverage. But, I don't want it to be cakey or dry. That is a tall order! This is a densly pigmented concealer that works very well in the under eye area. Full review coming soon! Physicians Formula Happy Booster Glow & Mood Boosting Powder, Translucent: I am all about highlighters lately. This one is such good quality! It gives a lovely soft shimmer without being overly glittery. I love it! I have reviewed the Happy Booster blush already. Stay tuned for a Happy Booster comparison post soon! Wet n Wild Coloricon Eye Shadow Trio Sweet as Candy: Wet 'n Wild has hit a home-run with their newly (past year) reformulated eye shadows. If you haven't tried Wet 'n Wild in years, then it is time to run (not walk) down to your local Walgreen's and pick up some of these great trios! Fab pigmentation, blend ability, finish, and staying power. High end quality with a drugstore price (and, yah, cheap packaging). But, hey, this is more than worth $3.00! Stila Custom Color Blush: What a cool concept...a "mood blush" or a blush that turns into your own "custom color" once it interacts with your skin. Not sure how this really works. But, what I think Stila has stumbled upon is a universally flattering shade. Love this! I recently reviewed this Custom Color blush. So, be sure to check it out! CoverGirl Lipstick in Dazzle Eclat #380: I love these new CoverGirl lipsticks! CoverGirl has really improved their packaging. This tube looks sleek and the lipstick itself is so pretty. Bourjois Effet 3D Cosmic Lipgloss Rose Artic: I have been wearing this paired with the CoverGirl Lipstick in Dazzle Eclat. This gloss is a pretty light pink with an iridescent and slightly lavender/purple shimmer. I love the wand with the lip brush. This gloss is thick without being overly sticky. Love it! Great formula! NYX Jumbo Eye Pencil Shadow Liner Milk : I have loved this for a long time! It is a matte white chubby pencil. Great for the inner corners, lining, and use as a shadow base. Bobbi Brown Gel Eyeliner in Chocolate Shimmer Ink: Bobbi Brown makes the best gel eyeliners! They were amongst the first gel eyeliners on the market. I started with Bobbi Brown gel liners. Then I tried other brands' gel eyeliners. But, I always come back to Bobbi Brown's! Yes, this is expensive eyeliner. But, it will last you a very long time! Just make sure you screw the cap on very tightly! Zoya Nail Polish, Marley (Marley): What a pretty polish! It is a lovely light pearly lavender shade. I love that Zoya polishes are free from many of the harmful chemicals that polishes can contain. Island Girl Hawaii Glitter Polish (Island Color): OMG, how pretty is this polish! This polish is *packed* with pink, lavender, and silver glitter. I have been loving this layered over pretty pink polishes. So sparkly! This brand is only available in Hawaii. So, thanks to my friend Lisa (who is lucky enough to live in Hawaii) for sending this to me! What fun polish! Your Best Face (YBF) Quench Lip Treatment: Best. Lip Treatment. Ever. Period. Seriously! This is a great lipbalm. But, its so much more than a lipbalm. This product is packed with highly effective antioxidants, lip conditioners, and anti-aging ingredients. Plus, it tastes good! I love everything that I have tried from Your Best Face and this lip treatment is no exception! Full review coming soon on Pammy Blogs Beauty! SkinMedica TNS Ultimate Daily Moisturizer + SPF 20 : This is my HG Sunscreen. I wear sunscreen absolutely every single day. I spend a lot of time outdoors in the Spring/Summer seasons. So, I figured this would be a great time to include my daily SPF in my monthly Star Products list! Granted, when I am outdoors all day, I use a higher SPF. But, for "everyday" this Skinmedica SPF 20 is perfect! It never breaks me out! Love it! Check out my Sunscreens for Sensitive Skin post. Colbert MD Intensify Facial Discs: These facial discs are so cool! This is a fabulous exfoliating product. These will leave your skin soft and refreshed. This product has kept my skin amazingly clear and refreshed. Check out my full review of the Intensify Facial Discs! Eco-Armour Eucament2 Shaving Foam: Love this shaving foam! It is all natural, bans irritation, and feels so refreshing on your legs. It even helps your razor last longer! Sigma F40 Large Angled Contour (From Nice in Pink Travel Set): I adore this blush brush! This came with my Nice in Pink travel set. Sigma travel brushes are the same as the full sized Sigma brushes only they have a shorter handle. This brush is just ideal for blush application. It is the perfect size and shape. Plus, it is super soft! Real TechniquesBlush Brush : Do any of ya'll watch Pixiwoo on YouTube? This is the brush line from Samatha Chapman of PixiWoo. Sam and Nic have a great channel with fab tutorials and tips so be sure to check them out! This brush is great for applying highly pigmented brushes. The brush head is very large and distributes powder well. This brush is also great for blending. The hairs are super soft (and synthetic). It washes well and even stands up on its end! Stay tuned for a full review of the Real Techniques brushes on Pammy Blogs beauty! I love many brushes from this line. The best part? They are so inexpensive and are available at Ulta and Amazon! Real Techniques Contour Brush (from the Real Techniques Core Collection face kit): Where has this brush been all my life? LOL! I love it! This brush is *ideal* for highlighter application. It is the perfect size and shape to apply just a touch of highlighter to your upper cheekbone and above the brow and down the nose. Perfect! I honestly have never had a brush quite like it. The kit comes with 4 brushes for only $14.99! What a steal for good quality brushes!!! Sigma Small Eyeliner E10 (from my Premium Travel Kit in Hot in Pink): This is the best eyeliner brush ever for gel eyeliner!!! Previously, I have used my Bobbi Brown Ultra Fine Eyeliner brush. That brush is great. But, I like this Sigma one much better. Plus, its so inexpensive! This brush is part of my Premium Travel Kit. The size and shape of this brush is ideal for doing a winged eyeliner look! This brush makes eyeliner application so easy!!! Redken Blonde Glam Color Enhancer - Perfect Platinum: This treatment has worked wonders for my hair! It is a purple conditioning treatment that eliminates brassy tones and leaves your hair very soft and manageable. I know I am guaranteed a "good hair day" when I use this product! Bath and Body Works Carried Away Fragrance Mist: What a yummy scent! It is perfect for warm weather. It reminds me of blueberries and raspberries! Almost all products were purchased by me. and the Colbert MD Intensify Facial Discs. I am a Amazon Associate. I so want to try carried away! I like to have a body spray for summer. Great favorites! I am dying to try the Sam Chapman brushes, too. I'm really into synthetic lately (so much softer and they dry so quickly). @Phyrra-Agreed! The Real Techniques brushes rock! @Claire-having trouble with YouTube uploading, hope to have the video fixed soon!